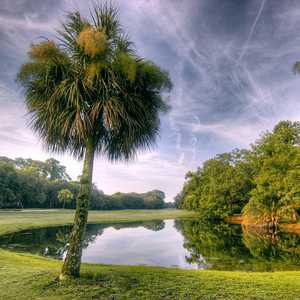 BRUNSWICK, Ga. - Coastal Pines Golf Club is one of those unpretentious, affordable golf courses where you can pay your green fees and have enough left in your pocket to buy a $2 hot dog and maybe even a $12 six-pack. True to its name, Brunswick's Coastal Pines Golf Club is set in a lovely pine forest. No deep rough, so you won't be spending a lot of money to replace lost balls. The clubhouse is a trailer, and no one is trying to pretend there's a big, fancy clubhouse coming soon. "We're a daily-fee, middle-income golf course," owner Wade Carruth said. "That's what we are. I'm 55 and I've been in this business a long time and I've seen what people enjoy." Carruth isn't saying they'll never get out of the trailer. He has 23 spare acres, and there might be some condos on the way. "When we do that, we'll put in a clubhouse," he said. Coastal Pines is Brunswick's newest golf course, debuting in the fall of 2001 - about five weeks after Sept. 11. Not exactly the best time to open a golf course, but they're doing good business now, about 22,000-25,000 rounds a year. The course is west of Interstate 95, well away from the ritzy addresses of the islands to the east. Undergrowth was cleared out to give the track an open, airy feel, and a touch of water keeps it interesting. "We pushed a lot of dirt because we're about 30 to 35 feet above sea level," Carruth said. "We got a lot of movement, which I'm pleased with. We built it like we wanted it. It's an open course, you can find your ball." Charlotte-based course designer Mark Bennett was instructed to build a fair, playable course. Coastal Pines runs a tad over 6,800 yards from the tips; the shortest of the four sets of tees is 5,313 yards, still a little long for more women. But the greens are open in front, creating bump-and-run opportunities, and there aren't many forced carries. You can score here - I shot a career low, which certainly says something - but you'll have to deal with some challenging holes. Marsh intrudes into the fairway on the 545-yard sixth, and the green is guarded by a large right-side bunker and water behind and to the left. The 10th is another good par 5, doglegging at about three-quarter mark. You'll want to be on the left lest the trees block your route to the green. It's a difficult second shot - the fairway narrows considerably with deep stuff on both sides, one of the few bits of menacing rough on the course. Coastal Pines is another playable, affordable Brunswick track for those who don't want to fork over the high green fees at Sea Island courses. You get a cheap, pretty easy layout set in a lovely pine forest, with tree-lined fairways characterized by gentle mounding. The fairways, greens and tee boxes are all in good shape. "When we first started playing here, it wasn't in too good a shape," said local Taylor Griffin. "Now he's got it in good shape, and it's consistent year-round." Green fees are $20-$30, an extra $14 for a cart if you want to ride. They encourages walking. The Holiday Inn Hotel and Suites right off I-95 (exit 38) a short drive from the Brunswick Golden Isles Airport, matches Coastal Pines' affordability and functionality. From there it's an easy hop to the barrier islands, the beaches and the historic district of downtown Brunswick. Two-room suites are available for families, and the hotel has an indoor swimming pool, business center, meeting and banquet facilities, free high-speed Internet access and a fitness center. The Holiday Inn's Millhouse Restaurant and Lodge serves up a fat, juicy steak, and kids eat free. Coastal Pines Head Professional Bubba Clark has a monthly golf-tips column in Brunswick Illustrated magazine. We played Coastal Pines on 10.16.10 and had a very bad experince with the staff. There was no starter and we where put in between a 5-some and 6-some. The ranger was rude to several groups and did not really have a clue on how to manage the flow of the course. I would not go there! There are much better run courses in the Glynn County Area. Sorry to hear you had such a bad experience...Really I am not! If you dont like it dont go back. Don't get on here and bad mouth the place. 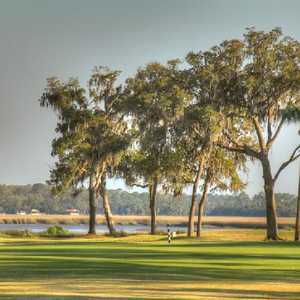 Go to the BWK Country Club where it takes six hours to play eighteen holes. The guys out at Coastal do a great job. Stop your crying!